Each month, we collect food items requested by A Servant's Heart Food Pantry on Franklin Street in Melrose. Founded in 1996, A Servant's Heart regularly supplies much-needed food to 150 families. We ask that contributions be brought on any Sunday of a given month and left at the back of the sanctuary. Contributions brought earlier should be left in the collection bin in the lower entryway near the church office. And please check the items you're giving to ensure their expiration dates haven't passed. 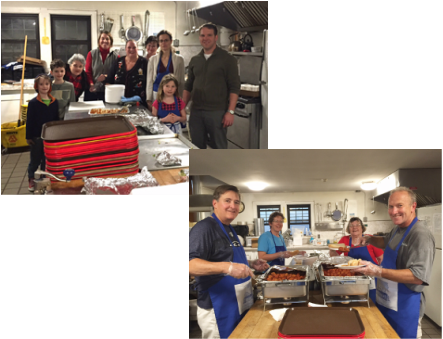 We regularly support the Bread of Life (BOL) Feeding Ministry in Malden by buying dinner ingredients, preparing the meal and cleaning up afterwards. We do this on the third Wednesday of the even months. Dinner is served at the Salvation Army, 213 Main Street, Malden. Donations of time and money are always needed. 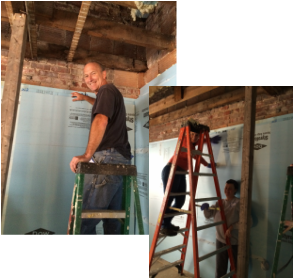 We volunteered with the Merrimack Valley Habitat for Humanity. We spent the day lending a hand as MVHH renovated the former St. Patrick’s Convent at 100 Parker Street in Lawrence into 10 safe, affordable condominium-style homes.